To ensure fairness and transparency at work for all employees through a legally binding contract that provides clarity, consistency and protections—a contract that you and your colleagues have a say in negotiating. 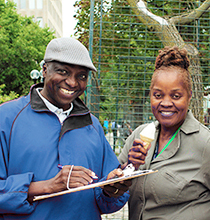 To provide you with a dispute resolution process to challenge violations of the collective agreement, once it is negotiated. To protect job security in a time of public sector financial restraint and uncertainty. 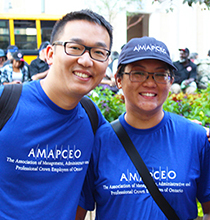 To gain access to excellent professional advice and support from AMAPCEO staff, legal counsel and volunteer representatives. To allow you and your colleagues to continue to provide effective public service to your fellow Ontario citizens without having to worry about poor working conditions, an unfair workplace, or similar distractions. "All of the AMAPCEO members within my branch carried over their collective agreement, benefits and salary when we [were amalgamated]. I heard that some non-union colleagues from all three organizations did not have the protection that AMAPCEO provided for my colleagues and I. If I had not been a union member, the same thing could have happened to me and I could have lost my seniority."